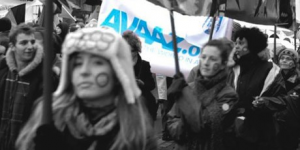 Posted by geoff on Dec 27, 2011 in World Peace | Comments Off on Support AVAAZ! Something big is happening. From Tahrir Square to Wall St., from staggeringly brave Avaaz citizen journalists in Syria to millions of citizens winning campaign after campaign online, democracy is stirring. Not the media-circus, corrupt, vote-every-4-years democracy of the past. Something much, much deeper. Deep within ourselves, we are realizing our own power to build the world we all dream of. We don’t have a lot of time to do it. Our planet is threatened by multiple crises – a climate crisis, food crisis, financial crisis, proliferation crisis… These crises could split us apart like never before, or bring us together like never before. It’s the challenge of our time, and the outcome will determine whether our children face a darker world or one thriving in greater human harmony. Maybe I’m just an optimist, but I’ve always had my private theory that the world is constantly getting better, despite the growing obsession with violence in the media. Many people make comments about how the world seems to be getting worse and worse, and while that’s true in some ways, such as environmentally, human civilization to me seems to be improving. With a few rare exceptions, it seems clear that most primitive societies lived in a state of near constant fear and violence. We often idealize native americans who we fantasize must have lived in peace and harmony with nature and each other, while ignoring the fact that many or most tribes practiced slavery and were in a state of constant and natural war with each other. So it was interesting to me to find this article in “New Scientist” about a book detailing that in fact, the world is getting better all the time as world societies mature and are growing less tolerant of violence, and despite the American love affair with guns, we tend to be finding more harmonious ways to get along with each other.